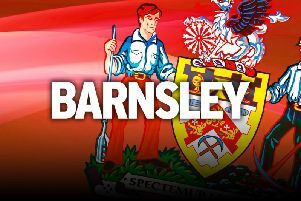 Barnsley loan star Oli McBurnie is wanted by new Rangers boss Steven Gerrard. Scottish striker McBurnie was awarded Oakwell’s Player of the Season Award despite only joining the ranks on deadline day in January. The 21-year-old impressed the Liverpool legend by scoring nine goals in 17 games as he tried in vain to keep the Reds in the Championship. McBurnie was on loan from then-Premier League side Swansea City - who are in the process of offering the promising young gun a contract extension at the Liberty Stadium. The Swansea top brass are keen for McBurnie to lead the line in the Championship after his exploits at Oakwell this term. However, with just a year left on his current deal, the club could agree a fee to avoid losing the player for free next summer. McBurnie is a huge Rangers fan and the task of trying to topple runaway champions Celtic under Gerrard’s stewardship could be too good to turn down. The likes of Championship clubs Leeds United – led by Paul Heckingbottom, who signed McBurnie for Barnsley before departing for Elland Road in February – and Sheffield Wednesday are also reportedly interested in the goalscorer. Meanwhile, Heckingbottom is eying up a reunion with Barnsley’s Andy Yiadom but needs to convince the Elland Road hierarchy to pursue the defender. Heckingbottom gave the Ghanaian international his big break, taking him from League Two Barnet to the Championship. Yiadom’s Oakwell deal is up this summer and he has refused signing an extension with the club. Striker Tom Bradshaw could also be on his way out of Oakwell, with Reading lurking as they prepare for a renewed push following a disappointing season in the Championship. Bradshaw bagged 11 goals by Christmas but was usurped when McBurnie and Kieffer Moore joined the club in January - scoring just once more before the end of the season. The Reds are believed to be interested in making Gabon striker Aaron Boupenza their first summer signing. The 21-year-old was the top scorer in the French third tier, on loan from Bordeaux, and would be available for around €250,000. With McBurnie’s loan coming to an end and Bradshaw potentially leaving, it would leave Moore and Mamadou Thiam - who has scored just once in 31 appearances for the Reds - as the only two recognised strikers at the South Yorkshire outfit.